"Use Grammarly for proofreading online because without proper grammar, readers might have a hard time telling the difference between a cat and a comma!" Written by the legendary Steve N.G. 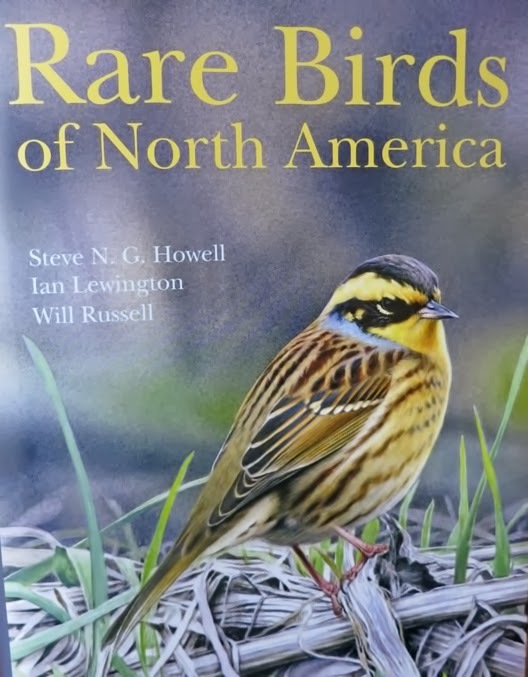 Howell and co-authored by Ian Lewington and Will Russell, "Rare Birds of North America" is a gem; not perfect but a gem nonetheless. Let me say right off that this book's introductory chapter alone, is worth the sticker price. 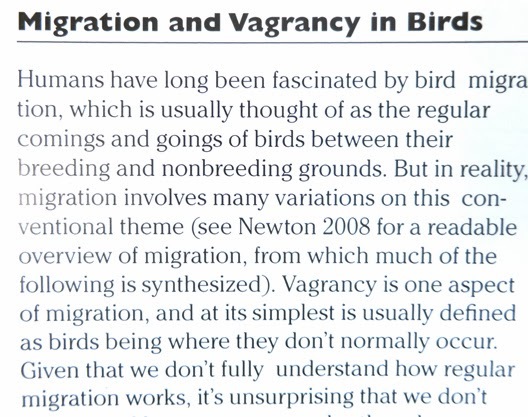 Especially, the section that covers "Migration and Vagrancy in Birds." That is how good I thought it was! While some birders might find it hard to wrap one's head around the information covering vagrancy, others looking for a little more information that will help them prep for or understand vagrancy will love this section. I predict that the pages of this chapter will definitely get some wear for those who are into this sort of information. The book covers 262 species originating from the Old World, the New World tropics and the world's oceans. It goes into details, the plumage, habits and more importantly the possible reasons behind avian vagrancy patterns. The authors were very detailed in breaking the processes of vagrancy into 6 categories which they discuss in depth with examples. The species in the book are broken up into groups such as Waterfowl to Songbirds. In these groups, there are subgroups broken up into species originating in the Old World and the New World. This area can get a little confusing, so it requires careful attention to the text in understanding the distinction and the reasons. The biggest weakness with this book is the little effort given to areas of "similar species." I understand that there is only so much a book could hold before a project gets out of hand, but a little more on similar species with text and comparison plates would have made this book much more useful. 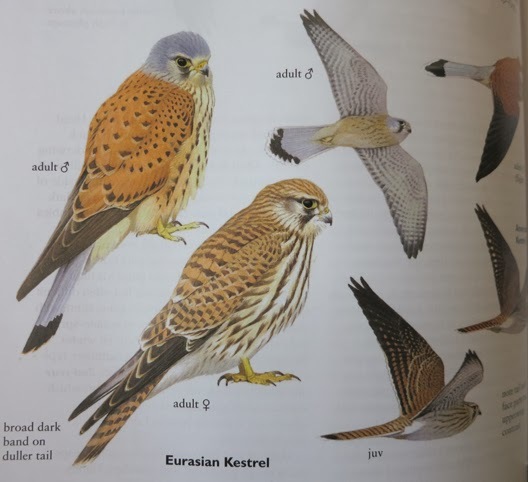 This book is already outdated in terms of a reference for North American Rarities - an example would be the 2012 Gray-tailed Tattler found by Jeremiah Trimble an MA and 1st East Coast record, which is missing from table 3 on page 19. Nevertheless, it is a welcome, overdue work on NA rarities and the reasons behind their vagrancy. One that deserves a read and who knows may even help you in finding your own North American MEGA rarity! Last weekend after a terrific Pelagic on Saturday (more on that in another post), I was out in the field on Sunday doing my best to act as a field guide to West Coast Pelagic Leader, Todd McGrath, who was visiting our area and co-led on our Saturday NY Pelagic. Todd and I had gotten off to a great start to the day when we heard first and then saw the Jones Beach LI Northern Shrike. The way we both keyed in on the mostly elusive Northern Shrike brought a chuckle and a nice complement from Todd. I decided that we should then head out to Shinnecock Inlet LI, to look for Gulls, which would also give Todd an opportunity to photograph some of our Gull species like Great Black-backed Gull which is not a common bird in Texas. While Gulls were the target species, it was the discovery of Sparrows along Dune Road that encouraged me to do this post. On our way to Shinnecock Inlet, we ran into some of my friends, Tom Burke, Gail Benson, Shai Mitra and Patricia Lindsay. They were Sparrow searching and had a Seaside Sparrow all lined up for us when we arrived. Full credit goes to Pat who had scouted the bird the day before and probably bribed it to stick around for us the next day. 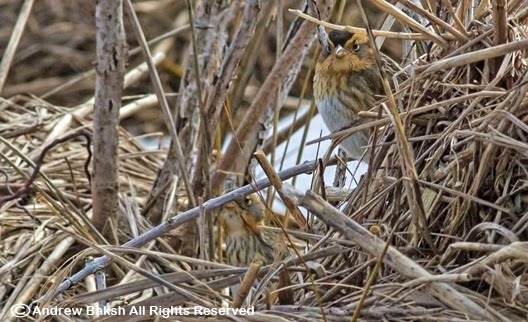 We then began looking for Saltmarsh Sparrows which were known to be in the area. Shai and I while searching near the edge of one of the marsh areas, kicked up one Sparrow which when it flew and landed, definitely looked good for a Nelson's and then as I moved to angle for a better look. Spotted another Nelson's type closer to where I was standing just before it flew, joining the other bird in a low brushy area that was in the marsh itself. Before I go further with our search in the field. A bit on the history of Sharp-tailed Sparrow. 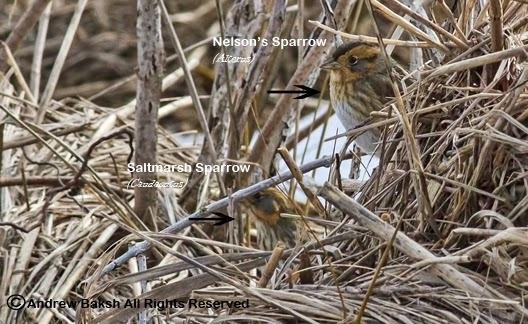 Since the split of the Sharp-tailed Sparrows in 1995, field guides have identified some of the important distinctions between Saltmarsh and Nelson’s Sparrow. However this has been a top level approach and a more granular level approach digging into the more subtler distinctions is sorely lacking in field guides. Nevertheless, more research, including studies of skins and digital photography has helped further the understanding of these subtle distinctions within the subspecies. With this in mind, the 6 of us spent about 2 hours working the area on Dune Road, patiently trying to get sufficient looks at the Saltmarsh Sparrows. During this time the discussion turned to subspecies identification and as such I attempted to document our findings with some field notes and photographs which I am sharing in this post with some comments on what the subspecies type were deemed to be. 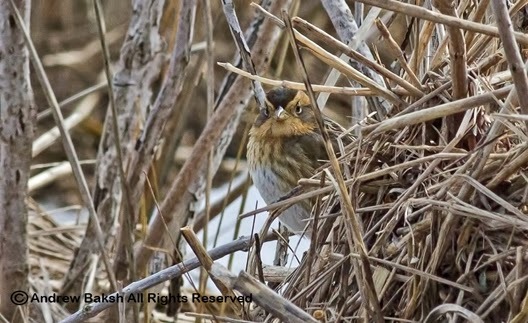 This bird was spotted by Shai Mitra, as it came out on the opposite side of the brushy area where 5 of us were standing. I carefully worked my way over to Shai without disturbing the bird.Then studied and took a few photos for review. Here, we see that this bird looks nicely marked for a Nelson's Sparrow, possibly Alterus which I am cautiously id'ing to subspecies based on range but keeping in mind that Subvirgatus cannot be ruled out. Do you see what is happening here? This stuff while it can be quite frustrating is exciting and a welcome challenge to try and decipher. At least that is what I think. What do you think? A side profile of the same bird, shows all the field marks associated with a Nelson's Sparrow. The ochre (orange color)on the face surrounding the gray auricular, the orange on the throat that goes down onto the breast, diffused streaks on the breast and along the sides. In this next photo, it gets even more interesting. A second bird that popped into view in the same area and luckily captured in the same frame, appears to be a Saltmarsh Sharp-tailed Sparrow, very possibly caudacutus which I am really calling based on range. Note how with this bird the streaks continue well marked on the breast and the sides. All good for a Saltmarsh Sharp-tailed Sparrow. The same two birds but not labeled and here the Saltmarsh Sharp-tailed candidate further solidified its ID as such with a better view at the throat area and breast. Note, how the throat is cleaner/clearer without the orange/ochre color that we see in the photo of the Nelson's candidate. A more frontal look at the breast streaking also show no diffusion as with the Nelson's. 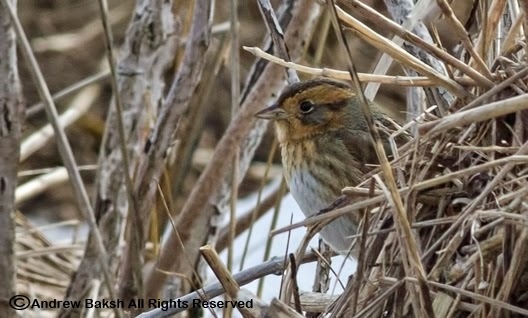 All solid traits for an ID of Saltmarsh Sharp-tailed Sparrow. 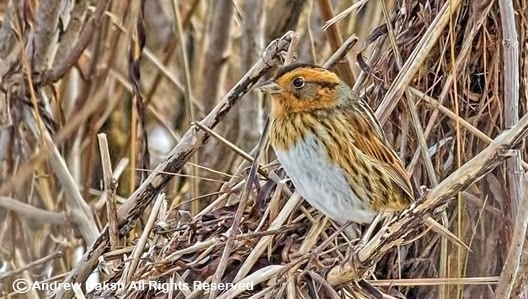 Compared to Saltmarsh Sparrows, Nelson’s Sparrows show more continuity between the colors of the face and the breast/sides. Nelson’s also have more pure-toned facial triangles, lacking the dusky tones within this area, especially in the rear of the supercilium, shown by Saltmarsh. 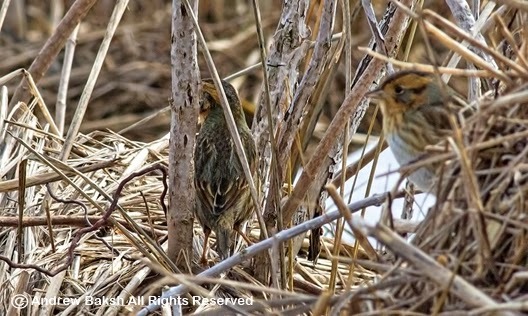 This image shows the back of the candidate for Saltmarsh Sharp-tailed Sparrow. As luck would have it, we had yet another Nelson's candidate this one was very nicely marked and perhaps makes a case for Nelsoni. But again I say this cautiously since David Sibley and James Rising, both authorities on Sparrow identification caution on attempting to differentiate Alterus from Nelsoni. During this exercise, I learned that identifying to subspecies these birds in the field is quite a challenge and near to impossible. Obtaining photographs can be helpful but still makes the job quite tough. Although, I took a crack at trying to identify the candidates to subspecies, it was done in a cautionary manner acknowledging that I could be wrong on all counts. However, unless more discussion on difficult topics such as this one is encouraged, we will never learn.